Why read about someone else when you could write about yourself? 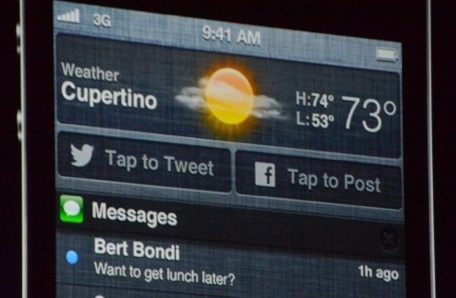 Soon the “Tap to post” to Facebook and Twitter buttons announced at WWDC today will appear in iOS and OS X Mountain Lion’s Notifications centers so you’ll always be just a swipe away from sharing. But that means you won’t have to visit Facebook or Twitter where you collide with what others create, diminishing the ambient intimacy they offer and turning them into ego-driven broadcast channels. By divorcing the composer from the content, sharing starts to feel like shouting into a black hole. So thanks a lot, Apple . You’re so bad at social you might actually be making us more anti-social. We’ve entered an unprecedented new age where a handful of companies possess vast control over the way we communicate. Seemingly small interfaces changes pushed to billions of people can produce drastic and unforseen changes in how we connect. Some argue a Facebook integration into iOS is meaningless compared to putting a man on the moon. I think quite the opposite. Only one of them has a real influence on the every day lives of hundreds of millions of people. Facebook and Twitter have always hosted their sharing composers right next to the content others have already shared. That means when you go to post a status update, you inevitably end up reading about the lives of your friends. Rather than making dedicated sharing tabs, both Facebook and Twitter’s mobile apps cleverly use sharing buttons that dump you back on their content feeds when you’re finished talking about yourself. But with time, OS X and iOS Notifications sharing could make us more likely to post “This is what I’m doing” rather than “What do you think about this?” “Look at me, I’m in Las Vegas” rather than “What’s something fun you’ve done in Las Vegas”. That’s a subtle difference, but the former can seem like you’re bragging while the latter feels like your starting an authentic conversation. Beyond being bad for our souls, one-way streets from Apple products into Facebook and Twitter could reduce the average Likes, comments, replies, and retweets our posts get. That means fewer re-engagement notifications, and fewer reasons to make return visits to the sites and apps where our social networks show us ads to pay their bills. In Apple’s unending quest to bring us convenience, it might have sucked some of the soul out of social networking. 900 million people yelling and no one listening doesn’t sound like a very friendly place to hang out.